Getting my ideas across by sketching them on paper using rough thumbnails. These are my original sketches for Mac's Mackinac Island Adventure. 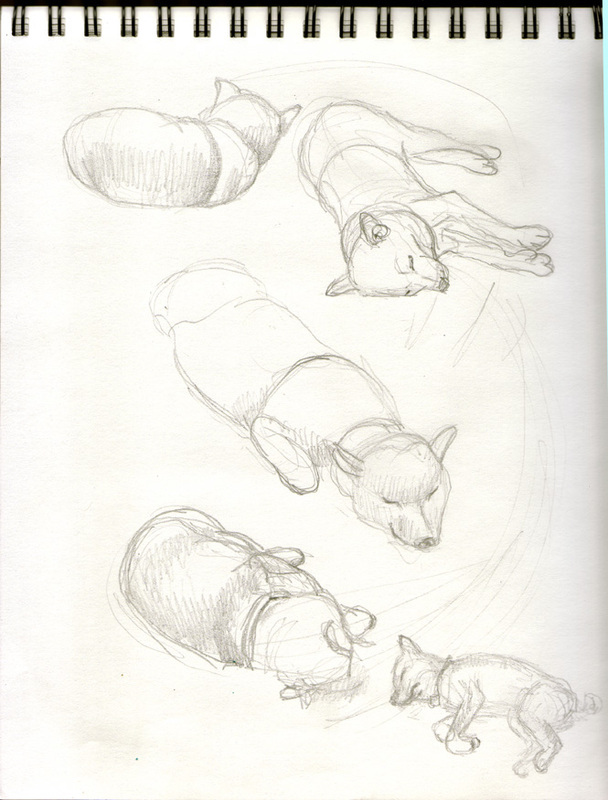 Quick sketches of our dog Windry. Observations. Do you know how some people are watch-ers and others are do-ers? I am definitely a watcher of people, places and things. I am an observer of 'nouns'. Ha Ha. I love to observe patterns, shadows and light. I even enjoy seeing patterns in people and family dynamics. I enjoy using my gift of observation; it is my muse. I think life is full of beautiful moments which I enjoy noticing all around me. I see it in nature, in the innocence of a discovering child, and even in...I confess....an awesome pair of shoes. As I go through the ordinary tasks of my day, I am constantly recording images in my mind. I study, turn and twist the images in my conscience like a toddler discovering a new toy. Then I tuck away the colors, patterns and images like treasures to revisit at a later time. When it comes to creating the images on paper, it is satisfying but a bit anticlimactic, because the thrill for me comes with the exploration and discovery of the idea. My process. I love problem-solving with color and line. I enjoy working with clients and helping them turn their ideas a reality. It is great to meet people, discuss possibilities, and brainstorm together. Getting Started. Regardless of the project, whether it is a personal greeting card, or a children’s picture book, I usually approach it the same way. 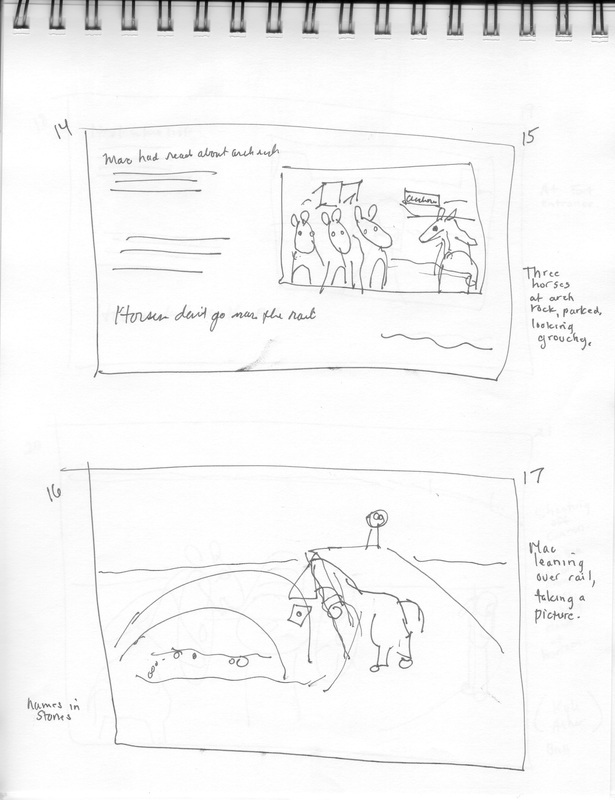 After first grasping the purpose, intent, and complete perspective of the project, next come the thumbnail sketches. Often called roughs, in my case.....I really mean 'rough'. Thumbnails help convey what I am thinking. My thumbnails are a quick, non-fussy way of depicting content and composition. I prefer to do thumbnails together with the client, so that it is visual communication which ensures that we are thinking along the same lines. Drawing Board. Then, comes the creative details and decisions back at my drawing board. It is then, that I usually flesh out the idea with a somewhat more refined drawing and wait for client approval. Once my drawings are approved I can advance to the final drawing, painting, or project. Choosing the medium. I think it is important to choose the medium to match the subject matter. The medium sets the tone as much as the color and/or line quality. Some projects are more suited for charcoal while others might be effective with watercolor or traditional oils. I love the possibilities. My approach. One example is the way I approached the illustrations for Mac’s Mackinac Island Adventure. I thought everything through with the island in mind. I wanted the island to be the focus as much as the character of Mac. I needed Mac to be whimsical enough to do the silly things he does, but I needed the landscape to be recognizable so I had to keep the drawings somewhat realistic. I chose the format to be horizontal so that when the book was opened the landscape would stretch widely to show the beautiful surroundings. I chose chalk pastel because for one, I think it revealed the painterly side of the Mackinac color palette. The second reason was that I’d be working through the winter months at my drawing board with windows closed, and didn’t want to be breathing in solvents, if I used oils. My intent was to use chalk pastel, to create ambiguous patches of color that allowed the eye to ‘read’ the shapes as something identifiable; like a smudge of gray that the eye thinks is the Grand Hotel or a dash of red, that reads as a lighthouse. Mostly, I wanted the drawings to playfully tell a story while still conveying the beauty of pastel on paper. My line drawings. If I had to describe my drawing style, I’d say that my line work has a gestural, less-fussy line quality. I usually find myself sketching with a line that meanders and explores the form in a way that is almost sculptural. I like to follow the details with line and focus on the patterns I see. Painting with color. My paintings, by contrast I prefer to explore the juxtaposition of colors. If while trying to decide how to portray my idea, and I think that color is the focus...........then I will paint the subject. Any medium has its advantages and disadvantages. I don’t really have a favorite. I let the subject matter dictate what I use or how I use it. I live in Michigan with my husband and son, and feisty little Shiba Inu. I am fueled by ideas and images, and am driven by the design process. I think designing is about problem solving, and making things beautiful and functional regardless of whether it is in clothing, packaging, or corporate marketing materials. I am an artist by nature. I freelance as an Illustrator and Graphic Designer. I loved my first adventure in the world of Children's Picture Books Illustrating and collaborating on Mac's Mackinac Island Adventure, and look forward to doing more. I've been able to do some fun varied free-lance jobs, (thanks to one of my fabulous sisters who hires me from time to time), such as an Assistant to Set Designer and Assistant Food Stylist. In my free time, I love being with my family and enjoying the outdoors. I enjoy reading, walking on trails, and dancing. Another passion of mine is nutrition and health which leads me to practice Homeopathy and Cranio Sacral. Lately, I've been inspired by the process of 'decluttering' and devising ways to live with LESS. 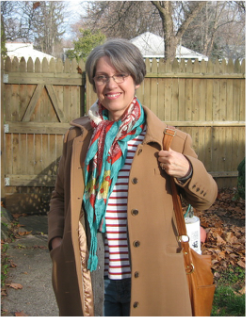 I am inspired by those who going through the process, and having been working intently on the formula for a simple wardrobe. It is an interest of mine. It is an amusement. I always encourage others to follow their interests and see where it leads them. I am doing just that. This is a personal exploration and is my way of sharing my experience with others. I will have posts on this topic from time to time on my blog.